The curve x+y represents the theoretical sum of attention / time / work. We all shift up/down the curve. If you follow from left to right suggest you are more strategic in your approach. Follow right to left you have a more emergent strategy. They need to find their sweet spot. What is the right mix of thought and action? to get the desired results. This entry was posted on Tuesday, July 29th, 2008 at 7:27 pm. I think you’ve almost got in the the statement “The curve shifts up/down due to external pressures”. I think that these more than anything effect the Action and even the Thought functions. For example if I’ve had a hard week at work with sick family then my want to Act or Think is greatly diminished, however, if you’ve had a great weekend relaxing and everything is going well you are much more likely to do & think. 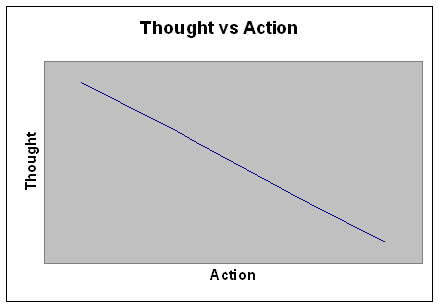 There is also a version of this graph over time that has more focus on action then thought then action etc. like this /////. One good way to get into action mode – make your life (or income) depend on it! This is what I wanted to illustrate in a response to the ‘Y Combinator is a cult’ article that was floating around yesterday. In the article they stated that when you work 18 hour days in a startup, you restrict your ability to engage in top notch creative thought. But 9/10, creative input isnt the thing that is required – you’ve already done that with your plan or idea. Grind is whats needed – that relentless, milestone driven stream of action. I spend alot of time surrounded by startups, and If I had to boil down a simple metric for backing winners over losers? Who’s at work at 9am on Sunday morning. They’re the winners. @Scollings Exactly this graph is just a snapshot in time. Maybe I could do a follow up on maximising the area under the curve. @Ben Milsom Interesting, I agree to a degree. I prefer to think grind would provide better on the ground information (as planning ends up being defunct quite often) so that when you pause to take a review your in a much better position.